• First time users of BMS MyWallet. (First Time Activation) • Rs. 100 Referral Credit . • ReferMyFriend is valid only on BookMyShow mobile app. • Sign-in to the `You` tab on the app and tap on ReferMyFriend. 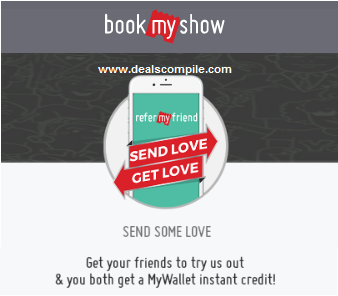 Note : You can also get your refer code and share it with your friends and get Rs.100 in your wallet.